Set away from the road and amongst landscaped gardens, our Self Contained Villas provide a quiet accommodation option and are perfect for shift workers, groups or small families. Our Self Contained Villas feature a spacious open plan design, kitchenette, ensuite, split system reverse cycle air conditioning, large LCD television with complimentary Foxtel and Wireless Broadband. Our Self Contained Villas have slightly different floor plans with varying bedding configurations. They either have a queen bed and a 2-Seater sofa convertable to a single bed, or a double bed and a signle bed. Please call us for more information. 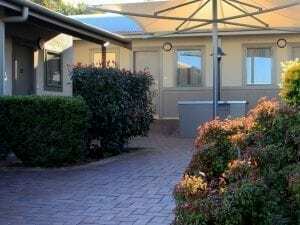 Located in leafy Mayfield and only a short drive from the Newcastle CBD,Travellers Motor Village offers 3 1/2 Star accommodation with various room types from budget to deluxe level. Our accommodation services are a classfood above the rest, ensuring that your next journey away is as comfortable and welcoming as your own home.